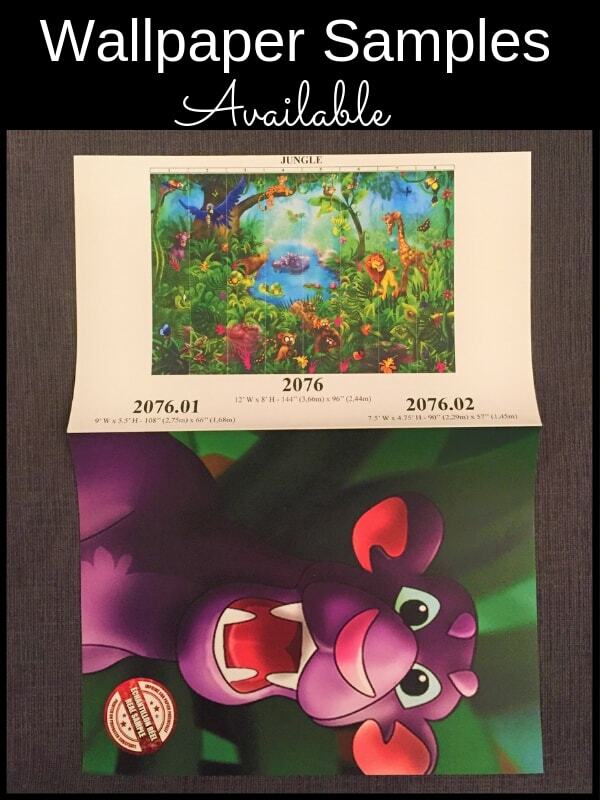 Looking for kids jungle wallpaper but still hunting for the perfect design? 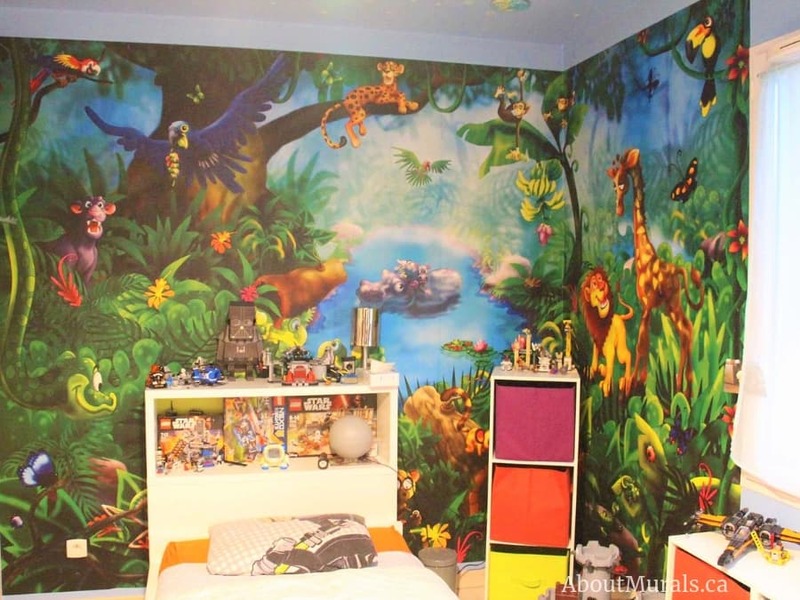 I’ve spent hours getting in touch with customers to get photos of my jungle mural in action in their homes, so you can see if this mural is the right fit for your kids. 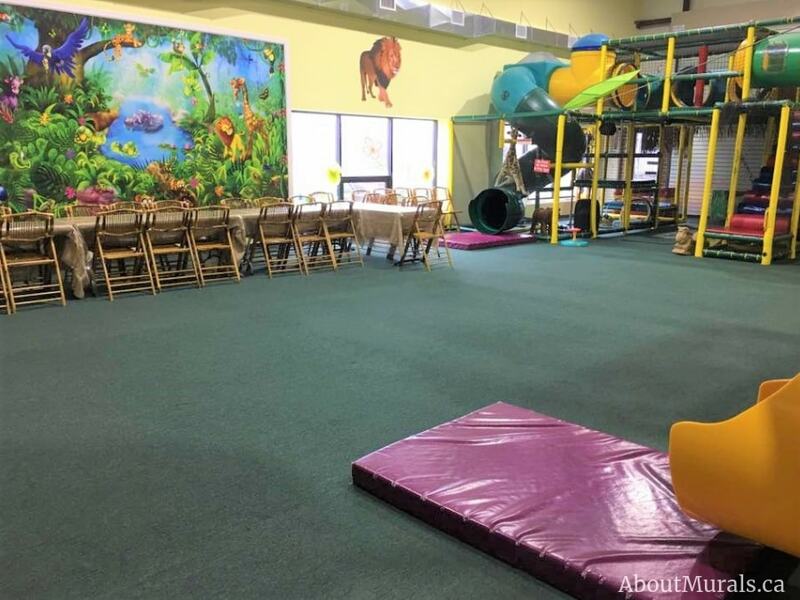 I figured you’d wanna see all the animals in the mural, without them being covered up by customer’s furniture, so here’s the (totally BORING) stock photo. 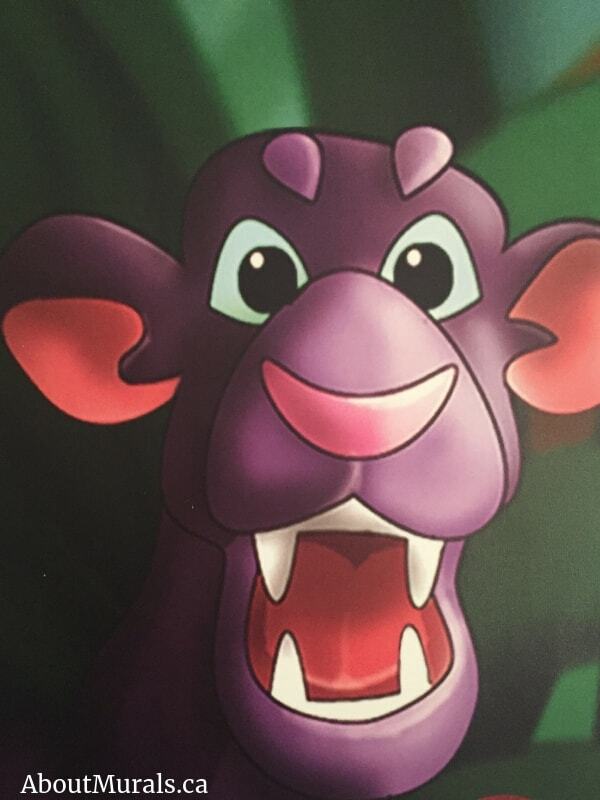 But less than boring is the adorable lion, giraffe, cheetah, panther, monkeys and tropical birds. Wanna see the texture in this mural? 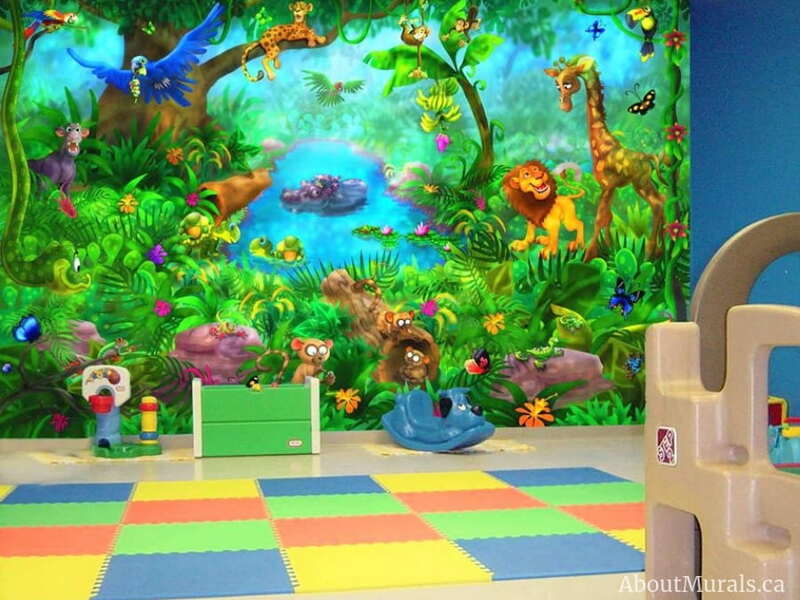 This mural is an illustration, rather than a painting, so you won’t see any brush strokes in this kids jungle wallpaper. The mural almost feels Disney-esque. One of the best things about my kids jungle wallpaper is that it’s removable, because let’s be honest, who wants to be married to a design forever? Sure, your kids love the adorable animals right now, but when they grow out of the design in a few years, just pull the mural right off the wall. Still skeptical? Check out the How-To Remove video I made for you! 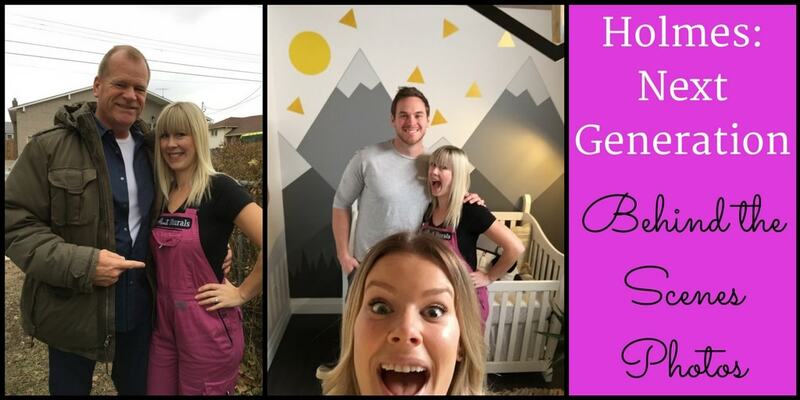 I made a How-To Hang Video for all my DIYers out there, so you can easily hang this wallpaper on your own. My wallpaper murals are all pre-pasted, so no messes by adding wallpaper glue to the walls or the back of the paper. The seams overlap and are invisible after they’re hung, so you don’t have to worry about double cutting (yay!). BUT, if you’re not the DIY type, I do offer installation services for anyone in the Hamilton or Toronto areas (Southern Ontario). Not local? Check out the Wallcovering Installers Association for a pro near you! 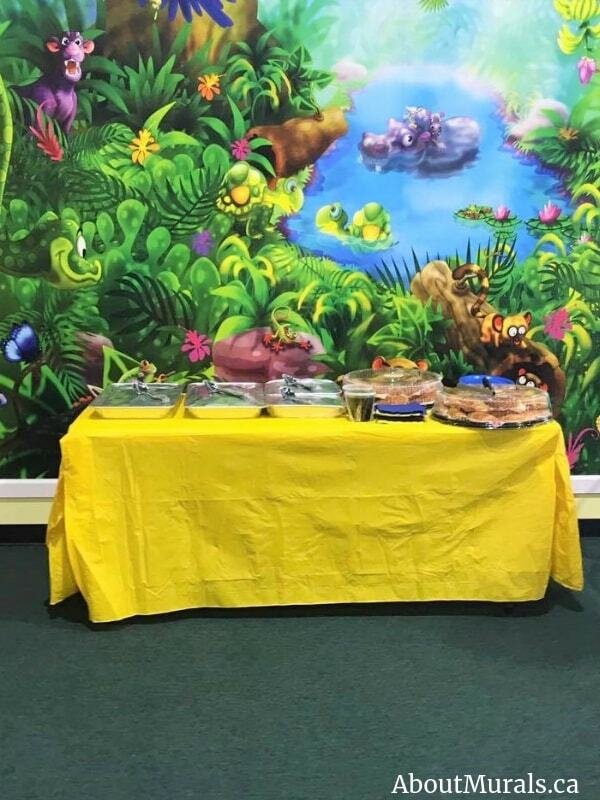 You can either hang this kids jungle wallpaper to fit the entire width of the wall, or buy one that is more narrow and centre it on the wall (like this customer did). I mention this in my How-To Hang video! FIND SIZES & PRICES HERE! If you’re thinking of a mural for your kids, you definitely wanna get something you can wipe down. Think sticky fingers, splatters, etc. Just use a damp cloth, and wipe it all away! 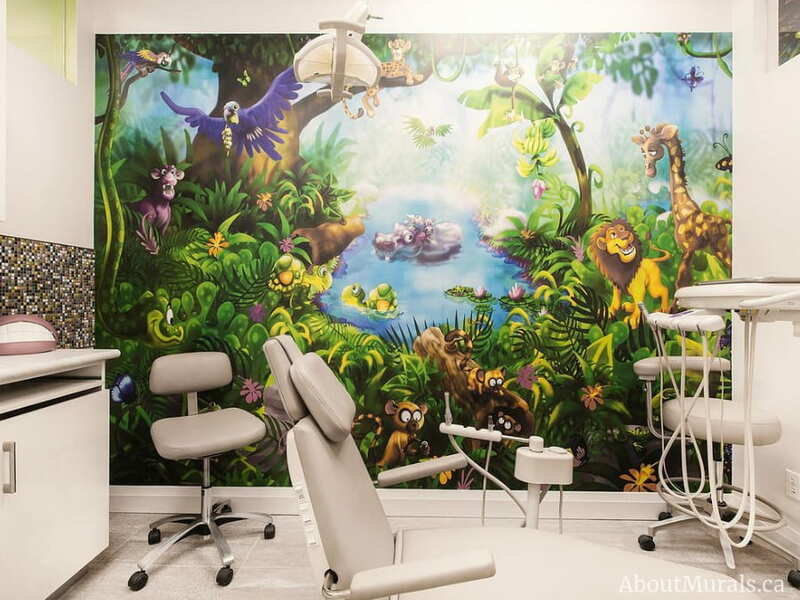 I love hearing customer’s stories that their kids have named the animals in the mural, pet them goodnight or that they make the kids feel more relaxed (like I’m sure they do in this dentist office). 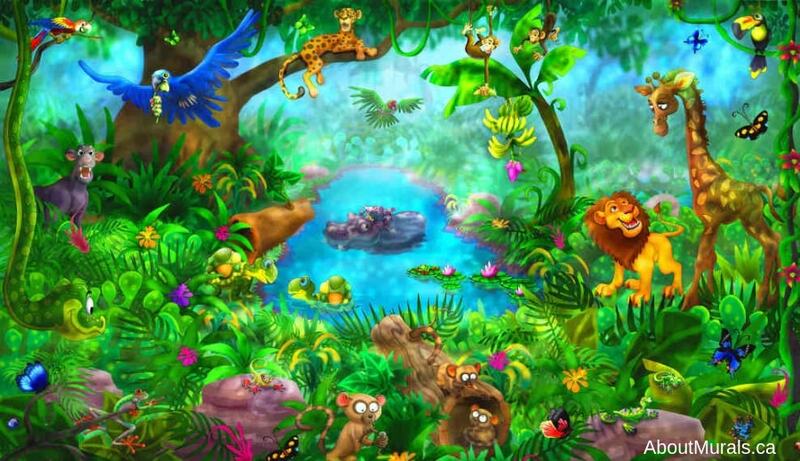 The characters in this kids jungle wallpaper will become a part of your family! Still not sure? Grab a wallpaper sample. Not sure if the colours will match? Need to feel the quality and texture of the wallpaper? Wanna test that it’s actually removable? Grab a wallpaper sample to ease your mind! Shopping online can be nerve wracking. Who are you really buying from? Are they trying to steal my credit card details? Is the website really secure?